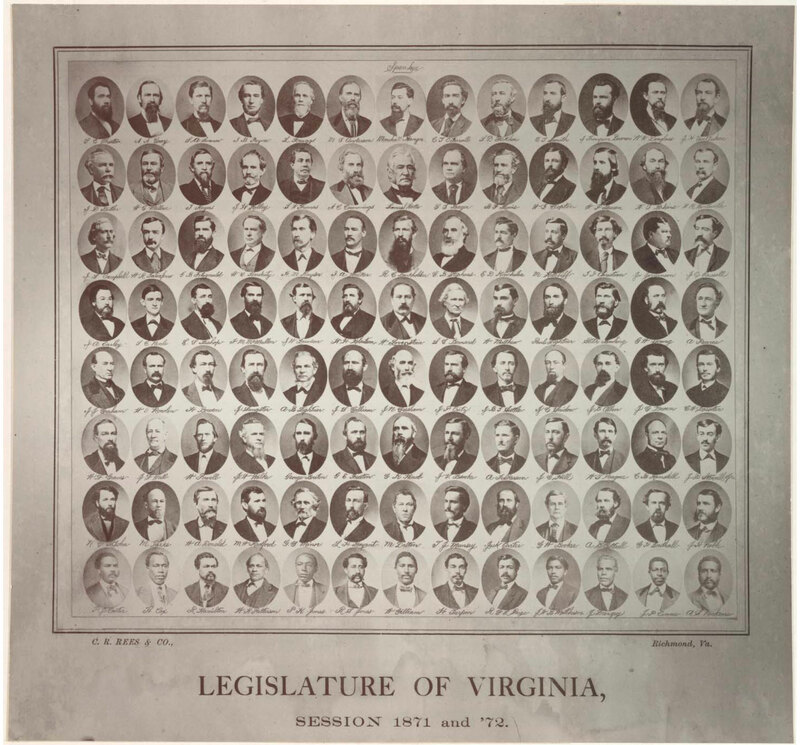 Members of the Virginia Legislature 1871-1872. Library of Virginia. My latest op-ed appeared in The Virginian-Pilot Wednesday. With February being Black History Month, I wanted to write something for it. I had run across Senate Joint Resolution 13 when looking at bills earlier, reading just the synopsis of the bill. Thinking that there might be a local connection, I finally found the time to read the whole thing and noticed that one of those referenced shared my last name. From the time I moved here, people have tried to connect me to the Paige family of Norfolk. But my own family is from the Peninsula and I’ve never found a link. Seeing the name of Richard G.L. Paige made me spend more time than I have right now to try to find a link again – to no avail. Nevertheless, as is always the case, I learned a lot about Paige during my search. One of the things I ran across in my research was the photo above, which accompanied the column in the printed paper. Of note is the placement of the black legislators: all are at the bottom. R. G. L. Paige is 5th from the right in that row. My own great-grandfather, Edmund G. Paige, was a contemporary of R. G. L. Paige. While R.G.L. was serving in the legislature, Edmund was doing some real estate investing of his own. I have a copy of the deed dated July 4, 1874 in which he purchased 6 acres of land in Elizabeth City County, now Hampton. Also like R.G.L., Edmund had been born a slave, but other than that piece of information, which was passed to me by my father many years ago, I have no other information. It is possible that my great-grandfather made his way to Hampton because of Freedom Fortress, Ft. Monroe. But that is pure speculation. Despite my efforts over the past 30 years, I’ve never found anything older than that 1874 deed about him. As for the Paiges of Norfolk – I doubt I’ll ever find a link between the two families. I’ve been told many times – as recently as yesterday – that I look like them. While that is true, it’s not because of my Paige ancestry; as far as I can tell, there is no white ancestry on that side. My mother’s side of the family is a different story; it is that side which I resemble most. My weekly column appears in The Virginian-Pilot on Wednesdays. You can see the columns as they are published here. With the recent update to the PilotOnline home page, navigation to my columns has been simplified: click on Opinion and then choose my name at the bottom of the dropdown list. You can also see the columns by liking my Facebook page. Next Post Go, Ralph, go!